Now for the exciting part! 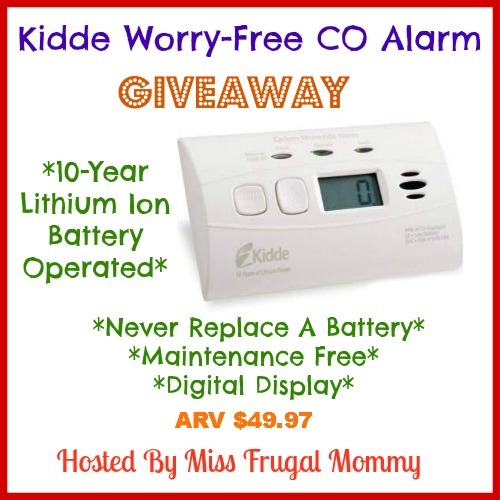 One lucky fan is going to win a Kidde Worry-Free CO Alarm (RV $49.97.) This giveaway is open to US residents 18 and older. Enter to win in the giveaway tools below, all entries will be verified, one entrant per household or you will immediately be disqualified. Winner will be contacted via email and has 48 hours to respond before a new winner is chosen. Prize fulfillment is the responsibility of the sponsor and not the participating bloggers. Good Luck!!! I like how they show you the different types of fire extinguishers there are and they tell you how to use them too.